Friday afternoon: Kyle House, Josiah Tongogara Street, Masvingo. 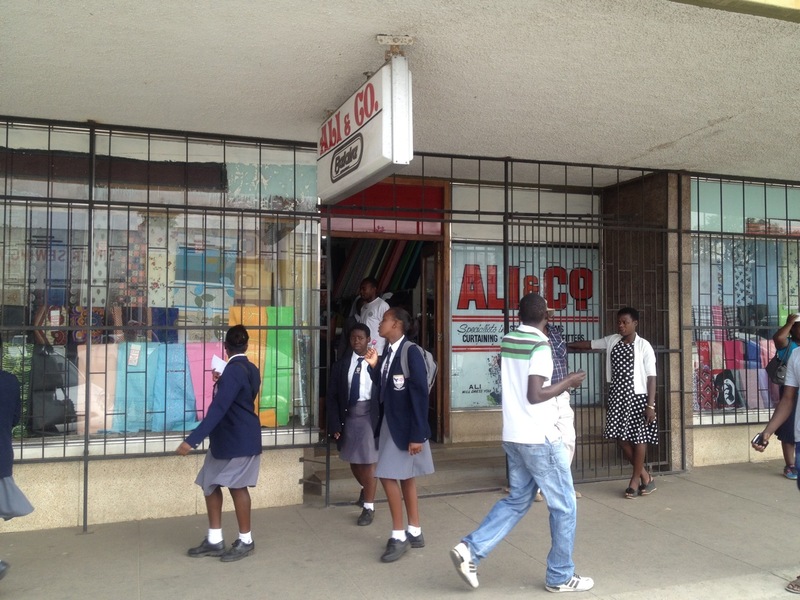 For our fabric needs in Masvingo, a town in southern Zimbabwe, Anneliese and I were told to look no further than Ali & Co. Located on Josiah Tongogara Street, Masvingo’s principal shopping artery, the shop is packed-solid with cloth and sewing accessories suitable for pretty-well every conceivable taste, budget and purpose. Judging from the number of customers who were out shopping while we were there, it was hard to believe that Zimbabwe is in such economically dire straits. Ali & Co. is owned by Ali Lambat and his son Zubair, Zimbabweans of Indian origin. Soon after the start of the 20th century, Ali’s grandfather, Ebrahim Lambat, left his village of Chasa in Gujarat, some 230 km north of Bombay (the present-day Mumbai), in search of new opportunities in Africa. Ebrahim landed in Portuguese East Africa (now Mozambique) and then trekked inland, making his way to the British territories of Southern Rhodesia (present-day Zimbabwe), Northern Rhodesia (Zambia) and Nyasaland (Malawi). 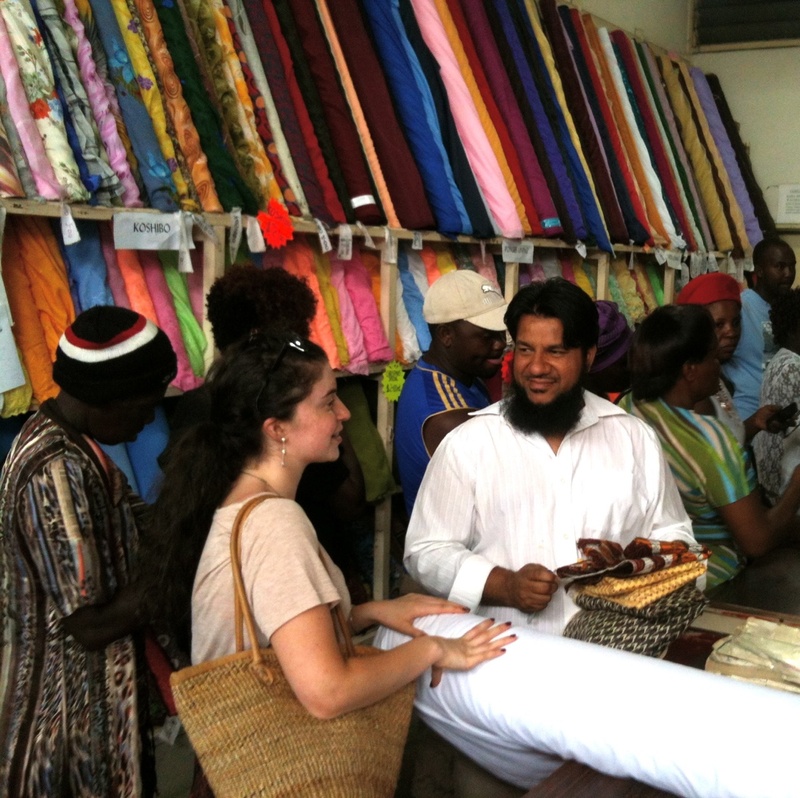 Like most Indians in these parts of Africa, the Lambat family initially made a living as merchants in rural communities, the larger towns and cities being effectively off-limits to non-White business owners. Masvingo, Zimbabwe’s oldest town, was founded (as Fort Victoria) in 1890. From its early years, Hindu and Muslim Indians have been a small, but economically significant, presence; like the Lambat family, most members of the community were Gujaratis. It was here where Ebrahim’s son, Ismail, opened a general store. Ismail died in 1968 and in the same year Ali started up Ali & Co.
Zubair explains the success of Ali & Co. as being due to his father’s hard work and his natural ability to make friends and entertain his customers. Early on he made his mark on the local community when he identified a niche in cutting and making curtains, then growing his business by taking his products to schools in the largely ignored rural areas. Southern Rhodesia had its own version of apartheid. As early as 1924 the British legislated against Asian immigration to the colony, a restriction that remained until the emergence of Zimbabwe in 1980. At this time officially just one percent (200 people) of Masvingo’s 21,000 full-time residents were Indian. Unlike in South Africa, there were no legal restrictions on where Indians or mixed-race (for the most part African/European, but also African/Indian – in particular Muslim Indian) “Coloureds” (who, for administrative convenience, officialdom were often lumped together with Indians) could live. That said, key public services operated a colour bar: as the only school in Masvingo for Indians and Coloureds – Helen McGhie Primary – was located in Eastvale, it was natural that these culturally very different communities congregated in this middle class neighbourhood. For secondary education, Indian children were usually sent to Salisbury (as Harare was then called) or Bulawayo, with the non-racial schools of the Marist Brothers being popular choices. According to Zubair, just eight Indian families (four Muslim and four Hindu) still live in Masvingo, a town of around 100,000 people. Even though a large proportion of the town’s commercial properties, as well as key retail and wholesale businesses, are said to be Indian-owned, Zimbabweans claim that there has never been resentment directed towards them. As with Black Zimbabweans, it is accepted that Indians were victims of the discriminatory practices of colonial rule. I was told by a former militant of the ruling party, ZANU, that some Indians discretely channeled funds to the liberation movements. But as a small – though economically strong – community, Indians have wisely steered clear of getting involved with politics….one of the undoings of White Zimbabweans in the years that followed independence. Like many other Indians with business interests in Masvingo, Zubair is based in Harare. Not only are business opportunities greater in the capital, so too are educational and social provisions. But even as a part-time resident of Masvingo, Zubair remains a prominent figure in local business. 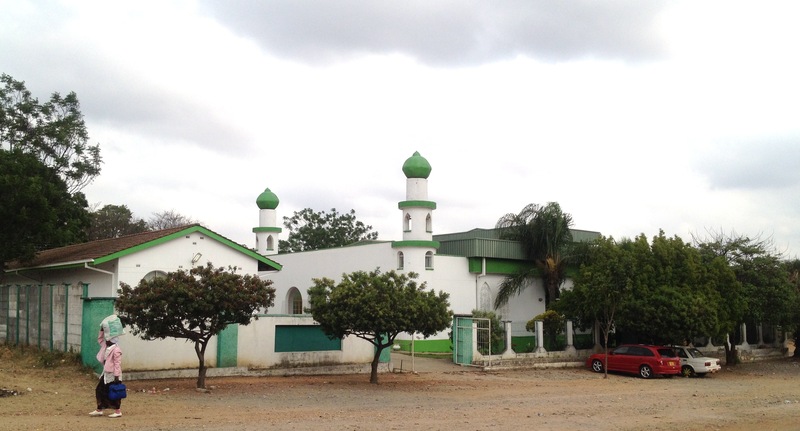 He is also a pillar of Masvingo’s small Muslim community, helping to support the local mosque and providing employment to fellow Muslims, mainly Malawians and Mozambicans. 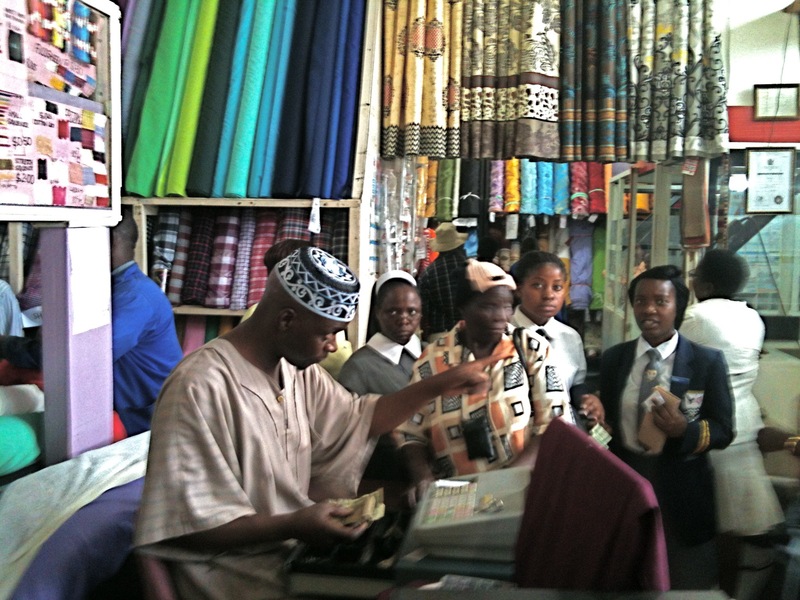 As for our shopping, we explained to Zubair that we were looking for African designs, preferably fabric that was made in Zimbabwe. There was some Zambian and Tanzanian, but perhaps predictably most came from China – made with African tastes in mind. The economic crisis had wreaked havoc on Zimbabwean industry, including the once important textile sector. Sadly only a few bolts of Zimbabwean-made fabric remained in stock: modernist designs of the Lancashire-based company David Whitehead that started operations in Southern Rhodesia in the early 1950s. 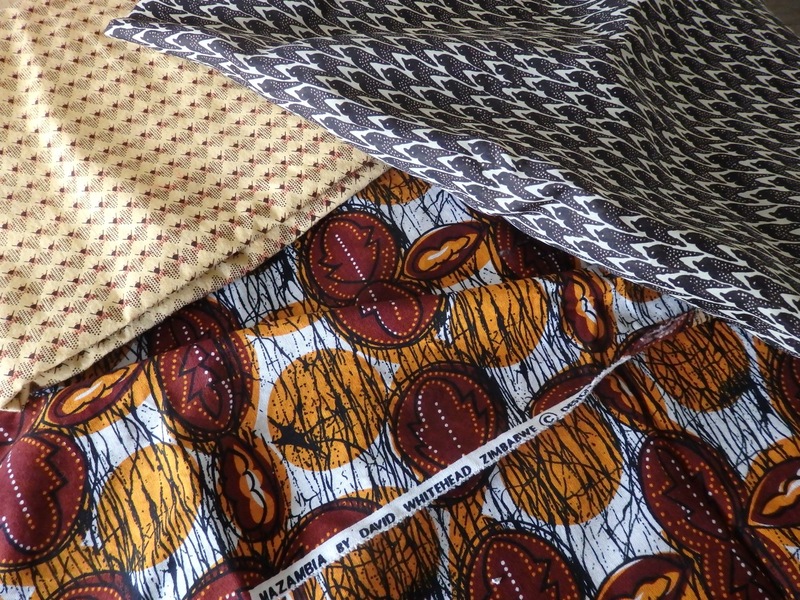 Zimbabwean fabric (below), imported Chinese fabrics (above). If you found this blog post interesting, please visit the home page to “like” The World Elsewhere’s on Facebook and/or to follow the blog! Fascinating piece. I have read a fair amount about Zim/Rhodesia, but I think this is the first time I have seen more than a passing mention of the Indian/Muslim minority and how it has fitted in under the old and new regimes. Actually Indians and muslims are very close. I grew up all around the world and I am Indian. Political people change it for their use. Thanks for your latest comment! There’s so much we don’t know about Zimbabwe — part of the problem is that journalists and academic researchers have long found it difficult to work in the country. My impression was that many of the Indians who have left the country retain still keep one foot there – Zimbabwe is their country too and eventually conditions and business opportunities will improve. Indians certainly haven’t been driven out of Zimbabwe for racial/ethnic reasons (as occured in Uganda and, to a certain extent, Malawi) but instead it was the country’s economic collapse that caused people to look elsewhere. Very much like my own history…from a different part of India..Christian and many from there came to East snd West Africa as teachers and moved south in search of a better life, and witnessing downfalls of many economies of the new found land. I lived in Masvingo from 1998-2000 and as a person of Indian descent (diaspora) I was interested in listening and writing on the Indian community in Masvingo. However hard I tried to find people to tell their stories, I was not very succesful. The same gentleman, who was the owner of the shop, tried to make appointments for me with members of the community, but to no avail. He told me there was seggregation; the Indian community lived at one end of the narrow river that runs through the town. The Indians were not allowed to enter the town for shopping or whatever. Even in the year 2000 the Duth Reformed Church of Masvingo did not allow people with a dark colour to enter even their church yard. I experienced this myself. I am a historian (PhD from leiden University). Thank you for your very interesting comment! It’s a pity that you weren’t able speak with members of Masvingo’s Indian community during your time living in the city. There must have been many more Indians in Masvingo at that time. Perhaps the general reluctance to agree to give interviews was because people were actively avoiding attention. At times of political upheaval (and 1998–2000 was the start of a very difficult period for Zimbabweans) it’s generally considered sensible for minorities, anywhere in the world, to maintain a low profile. Unfortunately the few studies that exist on Indians in Zimbabwe are not very helpful; with the global dispersal of the community, coupled with the passing of time, it will be difficult for historians of the future to piece together the story of the community. In all honesty, Indians harbour racist tendencies towards Africans and its only a question of time before they are dealt with. They should shape up or ship out! watch the space! Quite a sweeping statement! All Indians? It seems that not only Indians harbour racist attitudes…. Hmmm, I hope you at least see the irony in your statement. Stop being a racist. Yes – his statement is, umm, difficult to comprehend. Some people’s thought processes are baffling! Thank you for your comment! I don’t really have much more to add to this now, but I’ll try to investigate further when I return to Zimbabwe. Zimbabwe was once a bread basket of the region and till 1995 there were good roads ,infrastructure working,strong currency,but in many countries of the region like Angola,Mozambique the semi literate leaders without understanding capitalism or socialism pushed the countries to disaster.In Harare the leaders snatched the lands from the profitable commercial White farmers and rest is the history of destruction of a good country.Indians were always camp followers of British,Portuguese and French in Africa,about racism,sorry to say that it is inbred due to the 5000 years of draconian and rigid caste system of India. Thank you for taking the trouble to comment on the blog post. I have to say that I disagree with pretty-well everything that you wrote. Yes, it was often said by Rhodesians that the country was “the bread basket” of the region. This is nonsense. True, commercial agriculture was successful in the parts of the country that had been “snatched” (to use your word) by white settlers, but by far the most important produce was tobacco (and to a smaller degree beef). This was not food to sustain the region but agricultural commodities to bring wealth to a tiny proportion of the population. That’s not to say, of course, that Zimbabwe hasn’t suffered immensely by the misguided policies of the last 20 years or so, but these were based on a long and bitter history of the distortion of the country’s economy. I’m not sure who the semi-literate leaders of Mozambique and Angola that you are referring to. Like leaders throughout the world, some have had more education, some have been highly educated. The Portuguese left behind countries ravaged by war and these were places that under colonial rule only a tiny minority of the population had been given access to education. As for Indians being “camp followers” in Africa, they formed very useful functions in colonial Africa – whether as indentured labourers on sugar plantations in Natal, contract workers constructing railways in East Africa, or traders all over the place. To say that racism “is inbred” due to the caste system is ridiculous. Certainly some Indians in Africa display racist attitudes, but it is simply racist to generalise, as you do. That’s certainly not the case in the country with the largest Indian population in the continent: South Africa. There, Indians played very important roles in the anti-Apartheid struggle and the caste system is fast dying out. In any case, a large proportion of Indians in Africa have never been governed by the Hindu caste system. In Zimbabwe, for example, about half of the Indians are Muslims. Whatever issues you might have with Islam, “caste” has no real place, least of all amongst Muslim Indians in Africa. I came across your blog by accident and the story is fascinating. I lived in Masvingo during the early 1980’s and knew the father of the gentleman who was interviewed for the article. At that time the most prominent Indian businessman was my next door neighbour. He owned the Omar Kayyam Restaurant and nightclub. I wonder whatever became of him. I have a few stories to tell about his sons. I’m glad that you stumbled across the blog – and thanks for taking the trouble to comment. It would be interesting to do an in-depth study of this (former) community while there are still many people to potentially interview. As for your former neighbour….perhaps he moved to Harare to join the much larger Indian/Asian community, or perhaps he migrated to the UK, Canada, Australia or elsewhere.